After all, you’re just one person with limited bandwidth and you’re not sure whether your content will make a bigger splash on YouTube or Facebook. In fact, why not every platform? Meet Restream. Restream helps you reach a wider audience by allowing you to multi-stream live video across 30+ platforms. With Restream, delivering amazing live content to multiple video sites at once has never been easier. Restream takes care of the bandwidth and processing so you can focus on getting maximum visibility on YouTube, Twitch, Facebook, Periscope, and more! To get your watch party started, just choose a channel, click “Connect,” authorize Restream to access the platform, and then add any other channels you want to broadcast to — that’s all there is to it, folks. Once you’ve selected your channels, you’ll pick a broadcast software like OBS Studio, SLOBS, or XSplit. Choose Restream from the list of Services, paste your unique stream key from the Restream dashboard, and suddenly your screen is duplicated and ready to share. 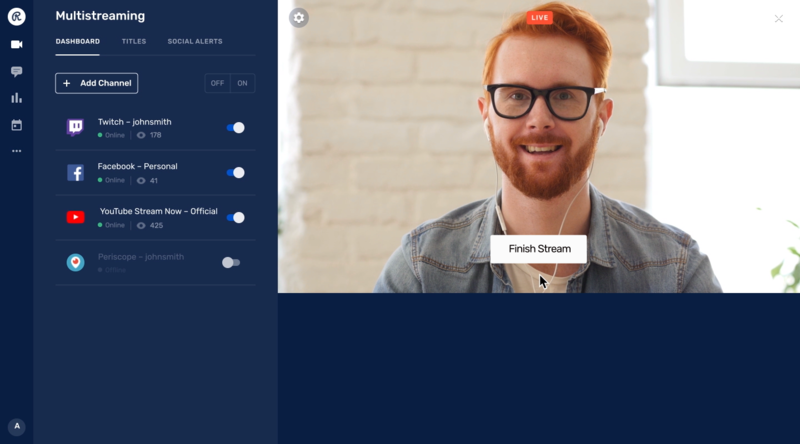 You can also stream directly from your webcam with the GoLive feature with no additional software or set-up necessary. And if you’re not available to stream, the Scheduler feature lets you stream up to 60 minutes of pre-recorded video live. Now you can engage audiences while catching up on emails (or Narcos). Restream Chat aggregates comments from different channels into one feed, so you can interact with audiences across all platforms (group chat is so lit right now). You’ll be able to manage chat communications from every channel on one screen — read and reply to comments from different channels without ever switching tabs! By turning on Relay mode in Restream Chat, you’ll even be able to bridge platforms so your viewers and communities can communicate with each other without ever leaving their preferred service. 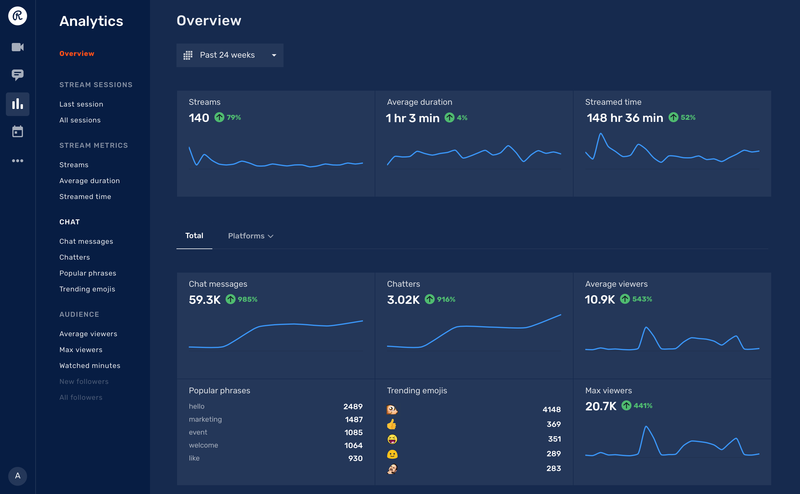 And when it comes to performance insights, you can track everything from stream metrics to audience stats. Restream also has a “Doubling” feature, which allows you to broadcast to additional channels of the same platform. Use the two additional streams on separate channels (e.g. one additional Youtube stream and one additional Periscope stream). When selecting your additional channels, you can mix and match among any of the channels — your options are endless! Content creators everywhere use Restream to live broadcast without platform or processing limits. Don’t confine yourself to a single ecosystem when you can go so much bigger. Experience the whole spectrum of streaming by grabbing lifetime access to Restream for just $49! Multiply your streams and viewers today! Restream is the first pioneer of multi-streaming and competitors just can’t keep up. Only Restream offers the full range of streaming tools from cross-platform chat to advanced scheduling to smart analytics — the other guys just spit out data copied from end platforms. Restream has built a thriving global ecosystem for your content focused on low latency streaming. Whether you’re in Moscow or Singapore, Restream’s servers serve you. Contrary to what Ghostbusters says, crossing the streams can be a good thing when it comes to delivering your content across every platform. Why stick with just one live stream when you could be everywhere at once? Rethink what you know about live video with Restream. 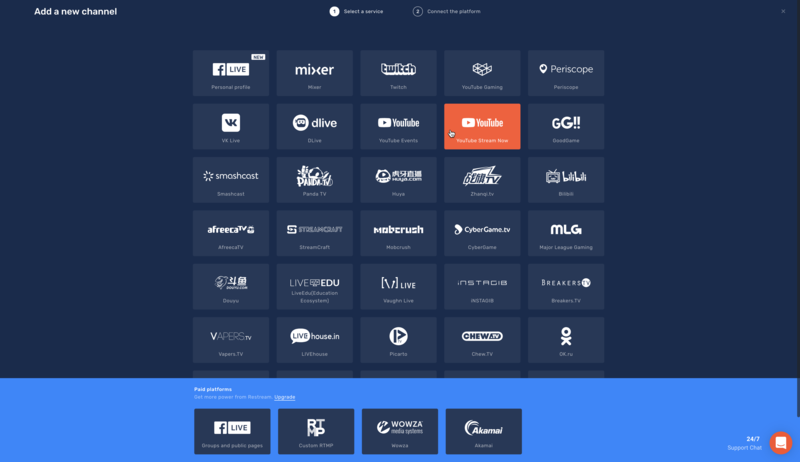 Get lifetime access to Restream now! P.S. Have a question about this Restream offer? Head on over to the Restream Help Page. P.P.S. Learn how to use Restream like a pro! Watch the demo webinar replay. 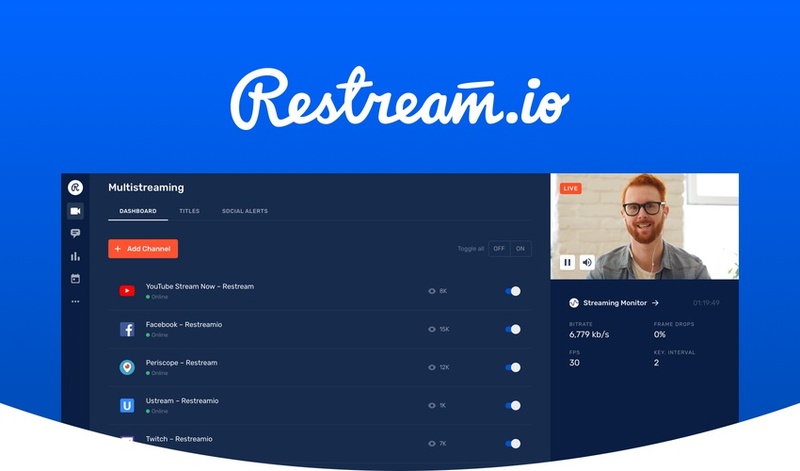 Note: “Multistreaming with restream.io” comes in the post of the platform you're streaming to. This can be easily be edited or removed once the streaming has started. If this is a deal breaker, please do not purchase this offer just to rate it low for this reason. Let's keep it professional and provide all feedback in the Questions section. No time limit on live streams.